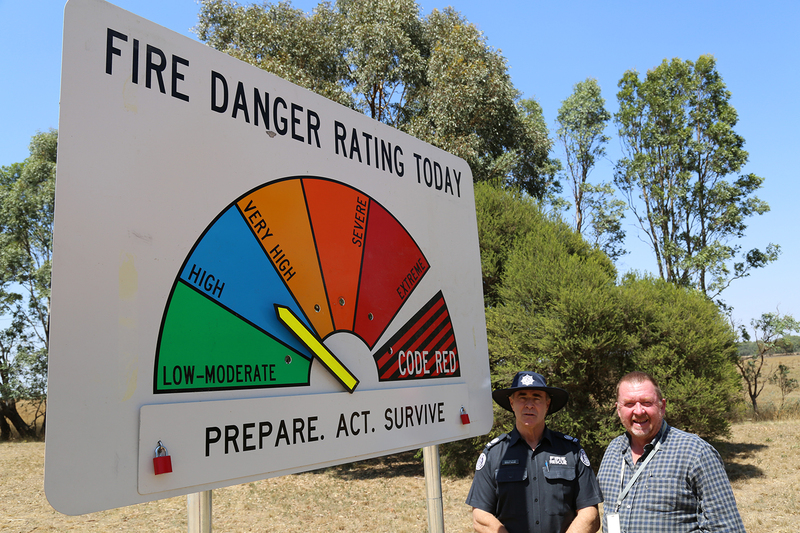 Photo: CFA District 16 Operations Officer Neville Collins (left) and Ararat Rural City Council Emergency Management (Fire) and Community Safety Co-ordinator Bob Barks with one of the new signs at Green Hill Lake camping reserve. New signs installed at the Green Hill Lake campground will make fire ratings clear after two camp fires escaped recently, one that was lit on a total fire ban day. Country Fire Authority Region 16 donated two large fire rating signs to Council after camp fires caused two grass fires in the camping area and surrounds. Ararat Rural City Council CEO Dr Tim Harrison said one of these fires was significant and burnt a large area of an adjoining paddock, and another was lit on a day of total fire ban, which was totally unacceptable. Dr Harrison said after the incidents, Council knew it needed to educate the many interstate and international visitors who used the camp ground about fire danger ratings. “The majority of people know their responsibilities on a day of total fire ban but we can’t assume everyone does, so the signs will help all visitors to Green Hill Lake,” he said. The signs feature an arrow that points to the day’s fire rating danger and a “total fire ban” placard that is flipped over as needed. They are changed each day by Council’s Community Safety Officers as part of their routine patrols. The signs were installed in mid January, one at the entrance of the camping area and the second mid-way through the grounds. Dr Harrison said police and the CFA have a zero tolerance approach to people who breach the total fire ban laws, and there was a strong state-wide push to make people more accountable. “Green Hill Lake can accommodate hundreds of campers on a busy weekend – if there is a fire there is real potential for disaster so these signs are very important,” he said.